Have you noticed? After so many years of the focus being all about online marketing, the business world has reached the top of the pendulum swing. And now, because of all the “white noise” being generated online, the real opportunities for cultivating deep connections with your ideal target clients, helping them make decisive decisions and gaining their commitment to move forward are actually happening… offline. WHEN OTHERS ZIG, YOU ZAG. Right now, if you are a growth-minded business owner or executive, or a self-employed professional, there is an early-mover advantage waiting to be seized. Just be sure you don’t wait too long; hesitation will cause you to miss the narrow window of opportunity open right now. Best of all, the opportunity to get face-to-face with your target clients, and on your own terms, is not only within your reach — it’s actually a lot closer than you realize. Often right in front of you, but ONLY once you know what you are looking for. Imagine having 5, 10, 50 or even 100 or more of your ideal potential clients in a room with you for anywhere from one to eight hours. How would you use that priceless time… and how would it affect your ability to turn those prospects into high-paying clients? The good news is that getting face-to-face with your potential clients can be done quickly, and with little risk or expense on your part — that is, when you know HOW. You see, we’ve cracked the code on how to structure and lead events of all types and sizes that give tremendous value to the attendees, position you and your company as the obvious go-to expert in your field and, most importantly, generate great profits. Best yet, we’ve not only done it over and over in our own business (in fact, in just the last few years our own events have grossed over $2.6 million dollars in revenue), but we’ve also taught our clients how to achieve repeatable results, too. When it comes to small, simple events, we’re watching both beginners and experienced business owners alike hit it out of the park — opening up brand new revenue opportunities they didn’t even know existed. And if you’d like to learn our strategies and secrets, here’s your chance. 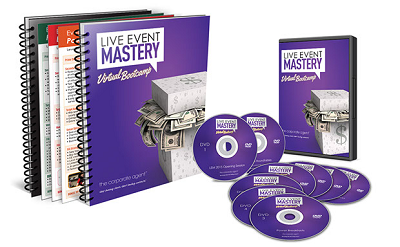 In the Live Event Mastery Virtual Bootcamp, you will learn the exact steps to hosting and profiting from three powerful yet low-risk, low-expense types of live events: executive roundtables, power breakfasts and pre- and post-conference workshops. You will learn everything you need to know to plan, fill, run and monetize these events. impact and income whenever and wherever you want.